Berkeley, Los Angeles and London: University of California Press, 1994. The contradictory nature of the work of Benito Pérez Galdós, Spain's greatest modern novelist, is brought to the fore in Catherine Jagoe's innovative and rigorous study. Revising commonly held views of his feminism, she explores the relation of Galdós's novels to the "woman question" in Spain, arguing that after 1892 the muted feminist discourse of his early work largely disappears. While his later novels have been interpreted as celebrations of the emancipated new woman, Jagoe contends that they actually reinforce the conservative, bourgeois model of frugal, virtuous womanhood–the angel of the house. Using primary sources such as periodicals, medical texts, and conduct literature, Jagoe's examination of the evolution of feminism makes Ambiguous Angels valuable to anyone interested in gender, culture, and narrative in nineteenth-century Europe. 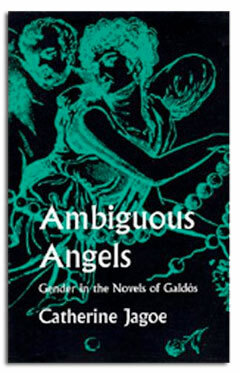 Click here to read an online review of Ambiguous Angels. Click here to purchase Ambiguous Angels.